1. Hey, Joe! Tell me a bit about your artistic, educational background and what type of work you had been doing prior to freelance assignments at Topps? What was your first project for Topps and other gigs besides Wacky Packages and Garbage Pail Kids? In 1999 I graduated from the school of Visual Arts in NYC with a BFA in cartooning. While working full time as a storyboard artist for television commercials I was freelancing on the side designing show posters and album art for local punk rock bands. 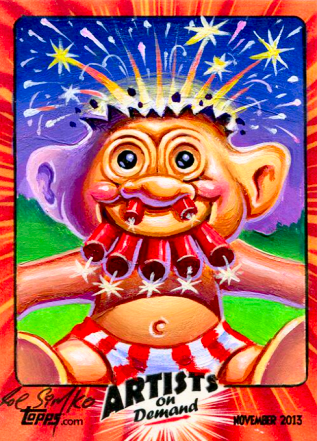 When I signed up with Topps, my first job was for a Garbage Pail Kids flashback card. Split Kit (Where are They Now). Since then, other Topps jobs I've been a part of include writing/illustrating for Wacky Packages, Hollywood Zombies (poster edition), Mars Attacks, and have even been hired to draw up concepts for GPK novelty items such as collectible toys and candies which never got to see the light of day. were you drawing your own Kids back in the day, during the GPK trading card craze? The way I got involved with Topps was from submitting ideas for my own line of trading cards called "Cereal Killers" I was pitching the idea to them for a possible release under the Topps company. 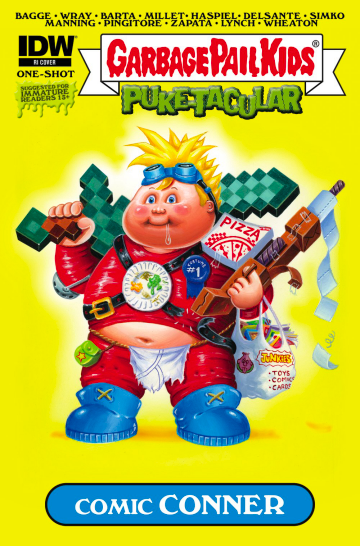 There was interest for a short while there but Ira Friedman and art director at the time, Jeff Zapata wanted to try me out on some Garbage Pail Kids and Wacky Packages first. The Cereal Killers never was bought by Topps, but I got to stay on board as part of the new GPK/Wacky art team. 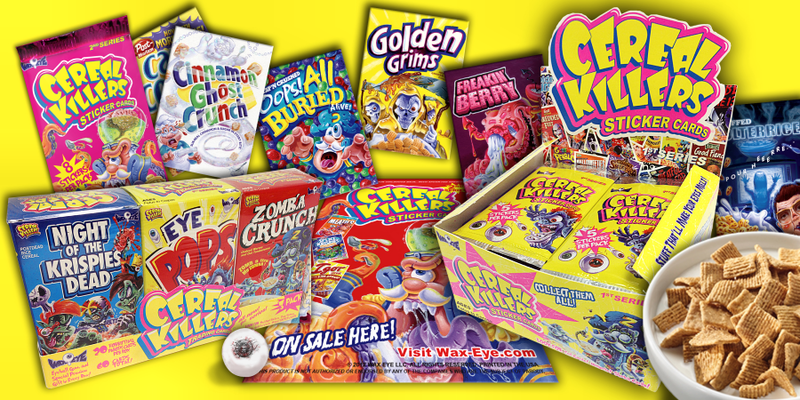 Cereal Killers eventually made it's way into the market when I formed my own company, Wax Eye with my wife, June. Working on GPKs now is a sweet dream job. I can work from home, set my own hours, even during the craziest of deadlines. I really just conceive of gross and disgusting ways to depict kids. I collected the cards as a kid in the '80s, and even drew up my own GPK comics. Never created my own back then, but I've made up for that now. I've created close to 200 new GPK characters since I've been working with Topps. 3. It's strange, I know you started working on GPK during the Flashback phase of the franchise, but mentally, I always think of you as an All-New GPK artist. Maybe because there didn't seem to be much of a learning curve to your GPK artwork, you were just that good, that quick and it blended right in. You came on board right during the throwback period, so ended up re-creating a few of the iconic GPK characters. Was there a struggle at all to get that GPK look 'just right' for you? Thank you for the compliments, I still look back at my first GPKs and see what I did wrong. Mouths and cheeks a bit off. The eyes also. It's funny because you would think they would be pretty easy to illustrate, but GPK heads are actually are a hard thing to master. I feel like I've gotten much better since the 2009 Flashback set. I hope to keep improving with each new series. 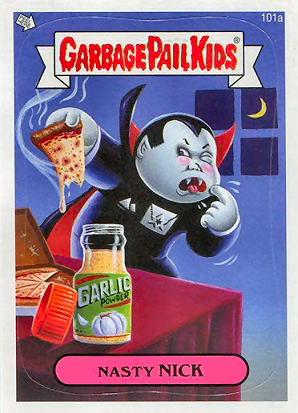 the underbelly of GPK cards, per se? Yes, Jeff needed an idea for the backs last minute, so I offered the idea of doing a spoof of Facebook. He liked it, or maybe just needed something very fast. In any case he asked me to write up the FAKEBOOK backs for 20 cards! It was a real rush job, with lots of heavy writing involved. Of course I knew June would be good, since she is always quick with ideas that are a nice blend of good timing and funny. So we worked on those together. And then we did it all over again for the next series when Colin [Walton] took over as art director. That was another 20 Fakebook card backs. No more Fakebook backs, please! 5. Speaking of your business partner; right dab smack in the middle of the Flashback releases and right afterwards, your company, Wax Eye, released not one, but two Cereal Killers trading card releases (and later a Stupid Heroes trading card set in 2014). How did this company and parody project come about and was it in the works prior to Topps or during? We formed Wax Eye after we knew Topps wasn't interested in the Cereal Killers card series. I knew these cards had to be released somehow, someway. So we decided we should do it ourselves. Best thing too. We have complete control over the whole property, which is always a good thing. 6. Although you provided artwork for the card backs and concepts for the BNS1 set, the explosion of Simko really happened during the Brand-New Series 2 set. That 'Dayna the Dead' painting! I take it you had some downtime from Wax Eye to really contribute to these latter BNS releases? With John Pound having retired from commercial artwork after the ANS sets and Topps using Tomas Bunk less and less, did you feel the impact of more work on your plate? After the Cereal Killers were released I did have some extra time to develop more GPK front card concepts. Perhaps that helped to pave the way for me getting more fronts to paint. I was getting a bit more GPK to paint at this time, but not as much as [Mark] Pingitore or [Brent] Engstrom. Those guys were the ground core of next gen GPK during the late 2000's , early 2010's. I think today we all get an even amount of cards to work on. Maybe some of us get an extra couple of cards here and there. 7. Amongst your own personal work for Wax Eye, freelance work for Topps (I don't believe some collectors are aware that you also work on just as many Wacky Packages) you somehow find the time to start a new company, Peel Here Productions. Where in tarnation and when in tarnation did the idea of a GPK documentary come into play and how was it realized? Were there hurdles with Kickstarter and then Indiegogo? Any fear it wouldn't be backed/funded and the goal reached? I'm a huge fan of documentaries (in general) and GPK, so it sounded like a win-win, to me. The idea of a GPK doc. film was something always in the back of my head. I was hired to design a movie poster for another documentary. I inquired with that team to join forces and help start work on a GPK doc. 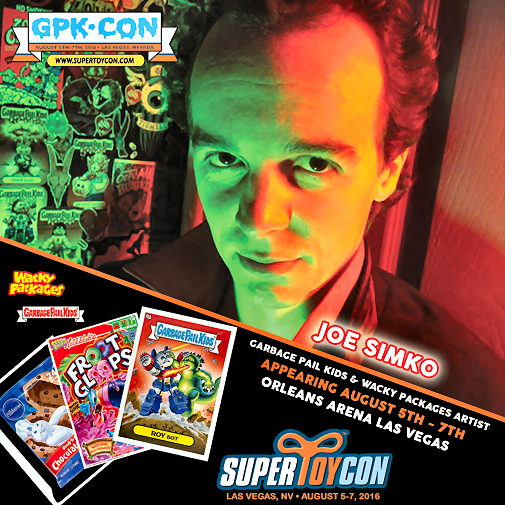 Jeff was instrumental in all of this since he had the contacts to all the original GPK creators/artists. He is the glue in between the veteran GPK guys and the new artists. We knew we needed funding. Since Kickstarter didn't pan too well for us, Indiegogo was the way to go, and it all worked out. Thank you also Aaron, for jumping in as Executive Producer. You have been a great resource for this project. [Ed. note: you're welcome, it was such a pleasure!] Once Jeff, June and I got to see our vision through with the making of the GPK doc. we knew we had something special. We always intended the film to be a document of not just GPK history, but of trading card history. To also explore other themes and ideas beyond the surface of GPK, such as parody laws during the '80s, the banning and controversy of an art form geared for kids. And ultimately the rise, fall, slow rise again of this art form popularized in the mainstream created essentially by a bunch of underground cartoonists. after 6+years, are you still as excited and engaged to work on these cards? The 2016S2 Prime Slime Trashy TV and 2017S1 ADAM-geddon sets sound and look very promising. It can get daunting at times when we have to work on a new set every few months. But believe it or not, I actually enjoy coming up with as many concepts as fast as I can. Being a GPK artist doesn't just mean that you know how to paint 1 or 2 GPK characters really well, it means you have to come up with many different kinds of concepts and then be able to paint a whole bunch really well in a short period of time. I submitted 121 concepts for the last set. I got 43 of those approved. Then I will submit a whole new batch of concepts all over again for the next set. Brent Engstrom was literally painting 4 GPKs per day during one of the last sets, and his paintings still looked clean and polished as ever. That's what it takes. I like the themed sets in a way. In fact that was something I wanted to do a few years back. Have an All- Monster set, an All - Movie set, All-political set, etc. The 24 hr. on-line sets are nice because we can be topical while staying current. And GPKs finally got back into "mainstream" press with the political cards we did. So it's a good thing if GPKs get their little spotlight again. 9. The 30 Years of Garbage documentary premiered in NYC over the 4th of July weekend, in attendance were artists James Warhola and Mark Newgarden. How was it working on this film and interviewing these many legends - being a genuine GPK artist yourself - and wrapping up yet another, hopefully fulfilling and rewarding project? I know Dr.Chud (talk about a jack-of- all-trades) worked on scoring the documentary, how long have you been in cahoots with him? Working on this GPK documentary film was one of the most rewarding and greatest projects I've ever worked on. Meeting every single one of the artists and writers involved with GPK was an outstanding experience I never thought would happen. I really appreciate what all those guys did. I've been working with Dr.Chud since about 2003, ever since he first emailed me out of the blue to do some work for his newly formed X-Ward album. He is so great to work with because he is mulit-talented, AND nice. He makes working together easy. or wrong, in a good way. Your comic entries were ideal, bringing the same feeling that John Pound and Jay Lynch had brought for the Meanie Babies GUFF comic. Will we see more from Wax Eye, Peel Here Productions, a NEW company? Where can collectors go to see Joe Simko artwork online (minus a 'Google' search)? Thank you again for the compliments, I really appreciate it. Are you sure I am not paying you for this interview? The IDW comic would've been great to explore if it lasted. I suppose all gross things must come to an end. Wax Eye is hovering still, but no new projects planned as of yet. People can still purchase Cereal Killers or Stupid Heroes cards on-line. Or play our Cereal Killers App game called "Cereal Boom!" My website is joesimko.com, but all of my most current up-to-date artworks and events are on my facebook page. Thanks! !